In 2006 I looked into my yarn storage and had an inspiration. 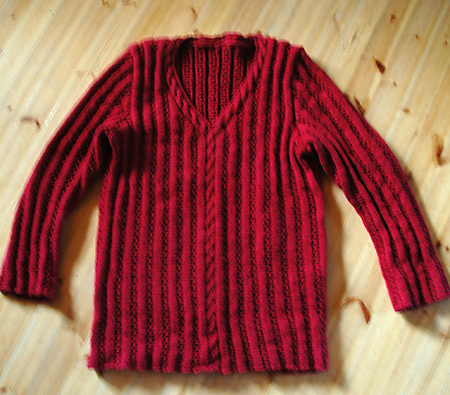 I selected wine red Novita Nalle from my stash, a yarn, which I had bought several years earlier. There was a nice pattern of wrap-over jacket in Suuri Käsityölehti, except that I didn’t want to make a wrap-over jacket. 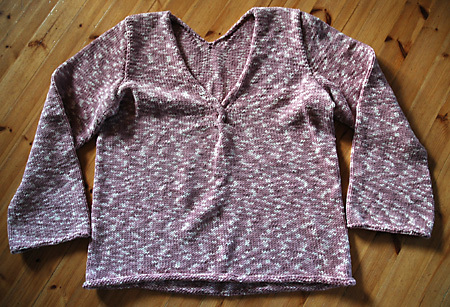 So I picked up the lace pattern and the cable neckline of the original pattern and turned it into a pullover. Since I’m hard to satisfy, there are number of things I should have made differently. Sleeves are too long and the body of the pullover would look better if a bit smaller or if I’d shaped it around the waist. 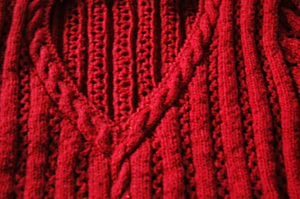 The small cable in the mid-front is too narrow (well, in the original pattern it was used around the edges, and I just adapted it without a second thought). The neckline, however turned out nice, though perhaps just a bit too low. The part of the cable round the back of the neck was continued from the front cables and attached to the back. It took me three versions before it was the right size, but it was worth the trouble. Once I got going, I continued with a simple tunic from Novita Samos. 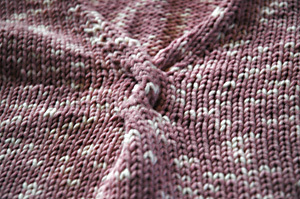 The yarn is soft and nice to knit, and I like the inconsistent patterns the yarn makes. Well, that’s about it, what comes to the things I like about this piece. 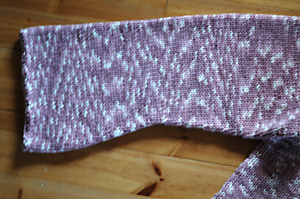 I knitted this on the basis of a pattern in Moda, but heavily modified it. I loved the short cable at the bottom of the V-neckline in the original, but made out of this yarn, it didn’t turn out as lovely. I made the sleeves wider, but I also knitted them too long. The body part of the tunic should have been shaped or smaller, now it looks like a sac. And the neckline is just a bit too low, so that I should either wear something underneath or carefully choose my underwear. Made small V-shaping in the neck, too, and that makes the sleeves drop from shoulders and therefore even longer. And the edge of the neckline tends to roll inwards. Blocking didn’t help at all. As a conclution: there’s not much good in this tunic. It would require heavy reknitting to make it look the way I wanted. Perhaps I’ll do it over again some day, but right now I’ll keep it the way it is for the future reference.